In a Personal Dowsing Session we will focus on checking a variety of things as they pertain to the client. This involves asking a series of questions in a very concise and pertinent manner and then making specific changes depending on the answers to the question. Here is a general way to describe dowsing: The Dowser has trained or programmed their system to react to an answer that comes into their system as a frequency. All beings are both senders and receivers of information – it is like we are the radio station and the radio at the same time. When we ask a question, our system sends out a frequency that is seeking in its nature. This is why it is critical to construct the question very precisely; we always receive an answer, but the quality of the answer really depends on the quality of the question! 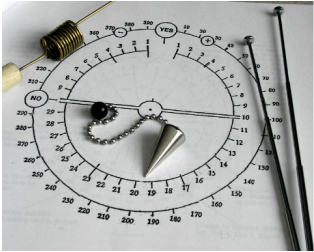 The frequency of the answer creates a neuromuscular response in the Dowser which moves the dowsing tool (pendulum, L rod, bobber etc). The Dowser can then read the answer via a chart or by the directional reaction of the tool. The second part is that for each detailed question asked, changes are asked for according to the need and for the optimal benefit of the client. Changes are noticed in the client at that moment and also over a period of time. Dowsing is an amazing tool to make changes in our lives. And remember, “Ask and you shall receive” – we get what we ask for and that is why the clarity of wording is so important. The uses of dowsing are almost limitless, but for the purpose of a personal dowsing session, we will cover 65 detailed questions creating a report that you will take with you. This is one of the modalities that lends itself to being done at a distance with great results. Dennis assists worldwide with Personal Dowsing Sessions. If you wish to be present you can see Dennis in person in a local session, connect on Skype or via telephone. You can learn to Dowse and have this amazing tool on hand to check and change frequencies to optimal levels. Whether that be for your personal relationship compatibility, your health, work situations, or clearing a hotel room so you can sleep. Or to clear a board room of previous negatively and set the stage for a great meeting. Dowsing can be used as a tool to further your journey. It is an elegantly simple way to direct your intent to reshape the world around you. There seems to be nothing that cannot be affected in a positive way with intent and a dowsing system. Getting to know about and use dowsing tools such as pendulums, L rods, and bobbers. Learn how to program your system to give you clear answers, percentages etc. Learn a variety of techniques to deal with changing the disharmony of relationships to changing the frequencies for prosperity, from raising life energy to changing the energetic frequency of property. There is much more that will be covered in the class. This is a very experiential format and is a very valuable tool and step in understanding and changing frequencies.